Replace your Ruger® MKII™, Ruger® MKIII™ or Ruger® 22/45™ sear with a Volquartsen Sear for a smoother, lighter trigger pull. 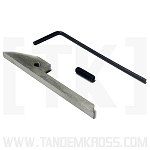 Combine with a TANDEMKROSS "Victory" Trigger for the best Ruger® MKII™ trigger, Ruger® MKIII™ trigger and Ruger® 22/45™ trigger upgrades. 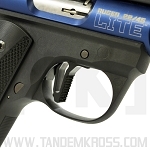 Want to turn your Ruger® MKII™, MKIII™ or 22/45™ into a competition-ready racegun? Upgrading the factory sear is a great way to start. The Volquartsen Target Sear for MKII™, MKIII™ and 22/45™ is a simple, drop-in upgrade that replaces the Ruger® factory sear. 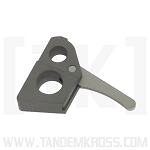 This EDM-machined sear is cut from hardened tool steel and is designed to provide the shooter with shorter, lighter trigger pulls. When combined with an upgraded Volquartsen hammer, TANDEMKROSS Steel Hammer Bushing and TANDEMKROSS “Victory” Trigger, the Volquartsen sear makes for the ultimate 22/45™ trigger upgrade. 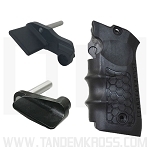 Get shorter, lighter, repeatable trigger pulls today with an easy-to-install upgrade from Volquartsen Firearms. This sear works great with the Tandemkross trigger. It lowered the trigger pull and there is less creep in the trigger pull, breaks nice and clean. I purchased this item to complete the build of my Ruger 22-45 and wow!!!! it made a big difference in the way it handles and functions it was simple to install and it dropped the trigger pull to 2.5 lbs which is exactly what I like did not need to buy the volquartsen trigger the tandemkross trigger worked fine. I have not taken it to the range as yet, but will keep you informed of results. good job tandemkross. 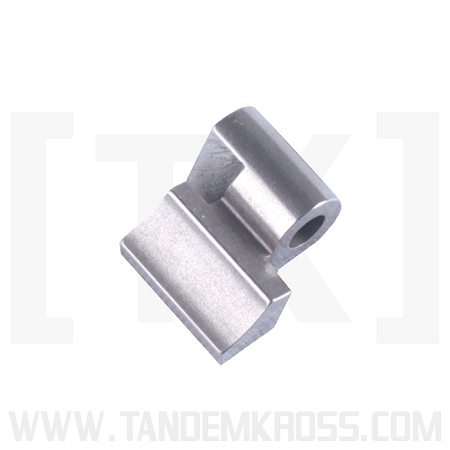 I've used these in all of my Ruger MK series pistols along with the hammer bushing upgrade. 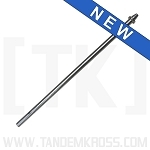 Nice to see this Volquartsen part available through TK too, since i order here more often than not. This was a simple install, since the Mark III I put it in already had the magazine disconnect removed. (If your mag disconnect has NOT been removed, I highly recommend you get a replacement bushing, and eliminate this ridiculous and unnecessary feature..) The trigger pull instantly improved, in both creep and weight, verified by my trigger scale and my trigger finger. Wish I had done it sooner! When used in conjunction with Target Hammer you notice an improved trigger pull. Worth every penny if you are interested in improving the Ruger 22/45.